As 2016 begins, Daddy Hasan Kamara, one of more than 4,000 Ebola survivors in Sierra Leone, is grateful to have his children with him. They mean the world to him. Nine of his family members were not so lucky and died from the disease, including one son. ?I?m really suffering, I?m really seeing things very hard,? Kamara said. Since his recovery, he has not been able to find work. He has eight children and two sisters to care for. 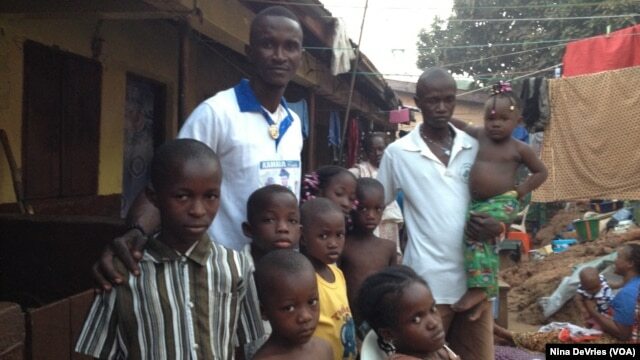 He contracted Ebola from his mother in November 2014, a time when the virus was surging across Sierra Leone. ?When I was in the treatment center I was totally mad over the whole thing," he said. "Even when the doctors called me to give me medicine, I always ignore [them], and then there were times the doctors feared me.? The Ebola virus, which is transmitted through direct contact with bodily fluids, also ravaged Guinea and Liberia. The initial outbreak started in December 2013. Over 11,000 people died during the crisis. Now Sierra Leone and Guinea have been officially declared Ebola-free by the World Health Organization. Liberia should be completely free of Ebola transmission by this month.